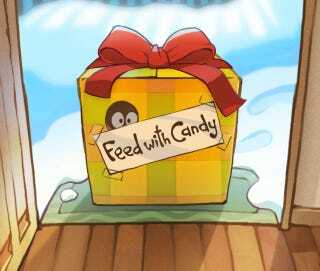 ZeptoLab's chart-topping physics-based iPhone candy muncher Cut the Rope is gift enough in itself, but we won't say know to the free standalone holiday expansion now available in the iTunes App Store. Cut the Rope is a devilishly addictive little game that involves slicing cables and avoiding obstacles in the name of giving the adorable little Om Nom the candy he needs to survive. The game is a staple at the top of iTunes game sales charts, so ZeptoLab's and publisher Chillingo are giving fans a little thank you in the form of the Cut the Rope: Holiday Gift. The free standalone game features 25 Christmas-themed levels, holiday music, achievements, and some festive costume pieces for the game's hero. On top of all that, the Holiday Gift also introduces a new game mechanic: Christmas Socks. When candy is dropped into one sock, it teleports out of another one, which should make for some interesting puzzles. Why do I need to explain this? It's free. Go get it.